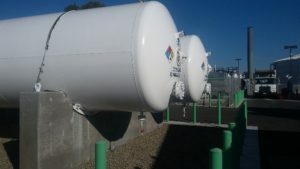 ANG cylinders from Cenergy Solutions. Adsorbent Natural Gas (ANG) vehicle cylinders and tanks hold natural gas in an adsorbent at low pressures. Our vehicle cylinders and tanks are FMVSS certified and DOT-compliant. They are safer then high pressure tanks and are a lot less expensive to fill since they do not require expensive high pressure compressors. The low pressure makes it possible to make some of our ANG tanks conformable making it easier to place them in a vehicle and increasing your volume in the same space by up to 70% in relationship to a cylinder in the same location. Cylinders can hold higher pressures but conformable tanks can be installed in areas that take up less space and make more volume available. 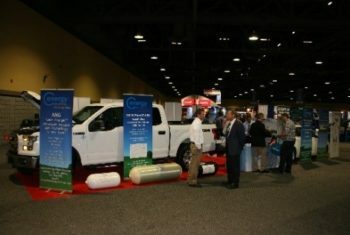 Cenergy Solutions has both types of cylinders available to be installed on all natural gas vehicles. 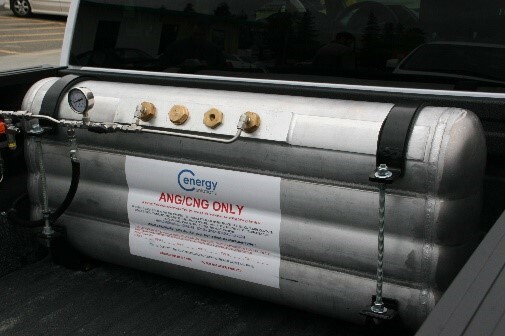 Cenergy Solutions can retrofit any new or used FMVSS certified and DOT-compliant3,600/3,000 psi CNG type 1,2 or 3 cylinder to be an ANG cylinder. This gives the customer the ability to store gas at low pressures with an inexpensive compressor or fill to high pressures at fueling stations if needed. Cenergy Solutions also sells ASME approved ANG stationary and trailer cylinders that hold from 22 liters up to 100,000 liters. These stationary and trailer ANG cylinders can be used to replace LPG tanks, store natural and biogas accommodate virtual pipelines or capture methane at wellheads and biogas digesters. The stationary tanks can also be used as buffer storage for natural gas transmission lines or biogas digesters. Custom ANG cylinders and trailers can be made to the customer’s specs.